Every day, an enormous number of commercial trucks carrying millions of dollars in cargo travel on our roads, racing to meet the increasing demands of a distributed economy. While the majority of these vehicles are operated with care and safety, accidents do happen, and the consequences can be severe. Large trucks are especially at risk for rollover accidents, in which the vehicle tips over sideways. Rollovers are extremely dangerous for everyone involved, including other drivers on the road. The Insurance Institute for Highway Safety (IIHS) reports that of all the large truck accident deaths in 2014, over half of the fatalities occurred in rollover incidents. The risk is even more extreme for passenger vehicles that are involved in large truck accidents. IIHS statistics show that of all fatal accidents involving a large truck and a passenger vehicle in 2014, 97% of the deaths were of the passenger vehicle occupants. As a motorist, you should always take extra caution when you find yourself driving near a truck. How Do Rollover Accidents Happen? Commercial trucks with trailers or tanks are massive, weighing as much as twenty-five times more than a typical passenger vehicle. This tremendous weight, combined with a higher center of gravity, means that a large truck is more prone to rolling than a car. But what exactly happens to cause a truck to roll? When a truck turns, the physics dictate that it will lean in the direction opposite to the turn. If the truck leans too far, as the weight shifts to the outside of the turn, the inside tires may come off the ground. The loss of traction can then roll the entire truck onto its side. This kind of rollover can seriously injure or kill the truck driver, destroy cargo, cause hazardous road spills, and crush anything that was beside the truck—including nearby passenger vehicles. Speeding. This is one of the top causes of truck accidents and rollovers. Drivers are often operating under tight deadlines, and there can be a real temptation to exceed safe speeds. Turning too quickly. The faster the turn, the higher the risk of a rollover accident, due to weight shifting and centrifugal force. Driving while drowsy. Driving while tired is unsafe no matter what size the vehicle is, but up to 80,000 pounds of truck makes it especially dangerous. Impaired driving. This is perhaps one of the single most avoidable reasons for any motor accident. All car and truck drivers should make the choice not to drive while intoxicated. Driver errors aren’t the only cause for truck rollovers. Mechanical problems and equipment failure can lead to accidents, for example. Poorly secured loads can cause dangerous weight shifting, and liquid loads are constantly subject to “slosh and surge” movements that drivers must be trained to handle correctly. Many other factors can also play a part in an accident. Driving a truck is serious business, requiring care and a definite commitment to safety in order to avoid tragedy. Who Is Liable in a Rollover? 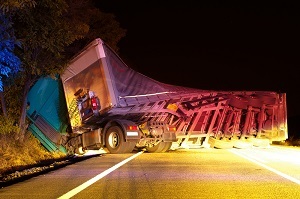 When the worst happens and a truck rolls over, there are multiple factors to consider when assigning liability. The truck driver may be liable for making an error, or another driver’s poor behavior could have caused the accident to happen. It’s possible that the company mechanics may not have maintained the truck properly, or a manufacturing defect could have caused a failure, leading to disaster. The local government may even be responsible if the road’s condition contributed to the accident. If you’re involved in an accident with a truck that has rolled, an experienced attorney can review the facts to help you figure out who is responsible to pay for the property damage to your vehicle, medical bills, lost wages, funeral expenses, and other costs related to the accident. If you need legal assistance after being involved in a truck rollover accident, the attorneys at Rechtman & Spevak are here to help you with your claim. Our skilled attorneys have over 50 years of combined legal experience, and we will stand up for your right to seek the compensation that you deserve. Call us at 888-522-7798 for a free consultation in our Atlanta office. Who Can Be Held Liable After a Truck Accident?